Panini has launched the first 2012 Panini Prizm Football Pylon auctions. It kicks off a month-long effort that will see a new batch of cards lists every day until the entire has been released. The cards are all one-of-ones that parallel the entire 300-card 2012 Panini Prizm Football base set. They have bright orange etching to go along with the rainbow finish. For the next 30 days Panini will list ten different cards on the Panini Authentic site. Each set of auctions last just 24 hours. New cards are posted at 1PM EST (10AM PST). 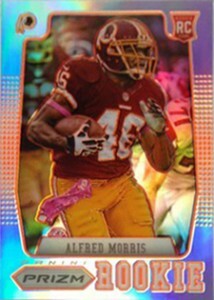 The initial batch of 2012 Panini Prizm Football Pylon auctions is highlighted by Alfred Morris. Within a couple of hours, the card surged past the $200 mark. Other first-week highlights include Aaron Rodgers, Peyton Manning and Adrian Peterson. Below is a look at the announced 2012 Panini Prizm Football Pylon auctions and their closing prices. Just wondering if you plan on updating final auction prices for these cards. I am looking for a complete price list on what these 300 cards go for. I work for the company that manufactured these cards. The fluorescent colored etch was my brain child, so I have a intimate relationship and interest in this set. Hoping to, but probably once or twice per week as opposed to every day.